Many forms of alternative therapies are available today and this book provides fascinating coverage of what they are with clear guidelines on how spiritually safe or unsafe they might be. The authors point to the early history and principles of alternative healing methods that enlighten the reader to the spiritual origins of new age healing practices. Many of these practices, including reflexology, yoga and acupuncture, to name just a few, have seen a rise in popularity even amongst some Christians. But are these healing practices spiritually safe and what are the consequences? 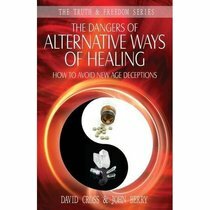 This book highlights the dangers and provides positive steps to take in the right direction towards true wholeness and well-being in our lives.It will help those who have been involved in alternative therapies and want to free themselves from its effects. About "The Dangers of Alternative Ways of Healing (Truth And Freedom Series)"
He graduated from Nottingham University in 1969 and qualified as a chartered civil engineer, leading to a varied working career, which included building roads and bridges in the Highlands of Scotland and, in the early 1980s, overseeing the construction of new town development in the New Territories area of Hong Kong. It was here that a huge personal change of direction occurred when he gave his life to Jesus. David and Denise have three children and eight grandchildren, all giving much joy in the midst of very busy lives. Besides the thrill of sharing God's truth through teaching and writing, David loves walking and photography. His authoritative explanation of God's word has brought understanding and healing to many who have been confused and damaged by the ungodly ideologies of today's world. John Berry, principal of according2jb.com, Inc., is a consultant and inventor of EV+2TM, a process-driven, software-based management methodology designed to help businesses drastically increase the amount of value captured from information technology investment. He is a former columnist at InternetWeek and Computerworld.